Can a billboard campaign help Ben Carson win Iowa? If you're driving into Des Moines from the airport, it's hard to miss Ben Carson's gaze. He stares at you from a billboard prominently situated on Fleur Drive, leading into downtown. That billboard, which proclaims, "Welcome to Iowa!" just went up this month, and it joins another Carson billboard facing travellers on their way out of town. That one, which was installed in June, says, "Ben Carson for President." The approximately 6,500 people who fly in and out of the Des Moines International Airport each day see these billboards, but if they spend some time in Iowa, they'll probably run into a few others around the state. A Carson billboard loomed over the state fair in August, where it was seen by over 1 million people. It was the only massive presidential sign in sight (the only other competitor for that above-ground real estate was Donald Trump, whose into helicopter flights at the fair were their own kind of in-the-air advertisement). 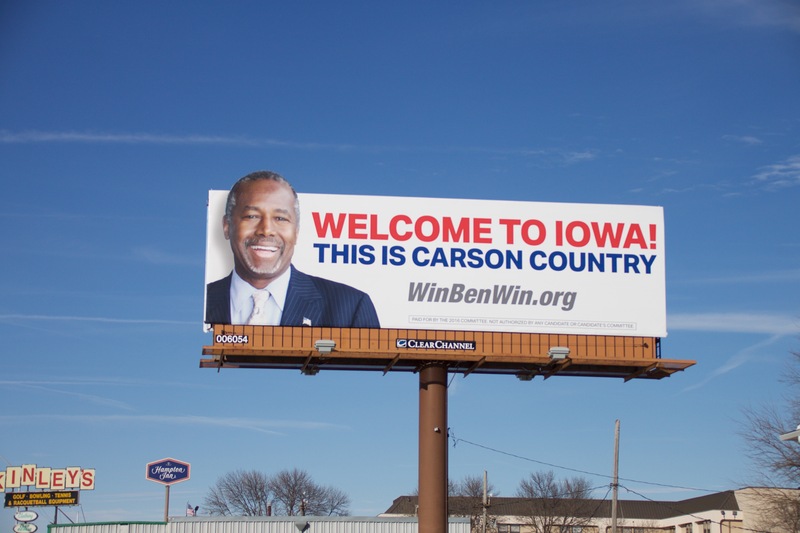 The super PAC supporting Carson, the 2016 Committee, is behind the billboards, and it's spending $20,000 a month on the 15 Iowa billboards that they'll put up by end of the week -- an increase of $5,000 in spending over last month. The 2016 Committee hopes to spur interest and conversation about Carson with its admittedly retro approach. With most campaigns focusing on newer technology, micro-targeting and the use of big data, billboards can seem a little quaint and outdated as a political tool. Betsy Vonderheid, the Media Director at SRCP Media, which made the media buys for Scott Walker's Unintimidated PAC, has not seen billboards used in a substantial way for at least 20 years. "It is a little bit of an unusual approach," Vonderheid said. "It is like a magnified bumper sticker campaign." She conceded that the billboards could be a good way to raise Carson's name recognition but still thinks the money would be better spent on targeted web ads. Tina Goff, the Northwest regional director for Committee 2016 is hoping for a different effect. Already, she says, "People say to me, 'Oh, I saw your billboard, and I didn't know who it was but I want to learn more." But not everyone is so interested. Moss Motors is a shop located at foot of the billboard that has been up since June, and Gary Moss, the owner, says that people aren't talking about it. "I honestly don't pay much attention to it," Moss said, noting that not one customer has mentioned it to him. "All we talk about is Donald Trump." Still, Ken Klein, executive vice president of the Outdoor Advertising Association, predicts that Carson "is going to stand out." "Right now people have a lot of ways to get info from their iPhones and iPads, but people spend a lot of time out of their homes," Klein said. Billboards, he suggests, can start the conversation about Carson away from digital screens. But if polls are any indication, Carson will need more than billboards to boost his candidacy. The latest CBS News Battleground Tracker poll shows Carson dropping into third, behind Donald Trump and Ted Cruz. In addition to the billboards, the 2016 Committee has also been fanning out across the state with canvassers and callers, sending direct mail and posting Carson signs in front yards and barnyards alike. And it's going to be taking its billboards beyond Iowa's borders soon. Over the next few weeks the super PAC plans to erect its first billboards in South Carolina and along the New Hampshire/Massachusetts border.